Recruiting international students is nothing – and everything – like recruiting domestic students to college. I’m the first to admit that the international arena is, or at least was, foreign to me. And, like a lot of learning experiences, the best way to learn is to jump in with both feet and take in as much as possible. I am far from an expert, but as I reflect on my international recruiting experiences over the last four months, I thought it might be helpful to share a few of the lessons I’ve learned relative to what is both different and the same. A bit of quick context, Doane College has a history of international recruiting (albeit not incredibly substantial at this point) and promotes internationalization of our students. That said, our international presence on campus is quite small and has been considered more reactive rather than proactive. So, when our President, Dr. Jacque Carter, encouraged us to make international recruitment (specifically considering a connection in China) a priority late last spring, the admission office had much to learn. Once we learned we would most likely have 6 students from China in the fall, our internal team scrambled to learn and make this work for the college and students. We have an individual in the admission office who has experience with the I-20 and also a good resource on campus in our Office of International Studies but this was going to be a bit different to what we typically experience with international students. In this case, we worked with an agent and the pace was much quicker with more on the line. Here is my quick reflection on the experience. Learn the lingo! I understood – in general – that there were additional different forms important to international recruiting such as the I-20. But, I admit that I had not spent much time on that form, and therefore did not completely understand the importance. The most important terms for me to understand and ultimately study to enable me to be effective were: I-17, I-20, and F-1 VISA. Specifically, we spent a good deal of time understanding and ultimately requesting modifications to our institution’s Form I-17. It was out-of-date and did not reflect the approach we plan to take regarding international student admission moving forward. It does now! I look back on my first days in admissions over 15 years ago and remember the new lingo I learned back then as well. Determine the difference between an internal policy (or practice) and the law. Many institutions have created internal policies in order to minimize institutional risk relative to international recruitment. This is important, but internal policies may need to be modified, particularly if they haven’t been reviewed in years or if they don’t match with an institutional direction. It is possible that one of your greatest hurdles in recruitment is one that you created unintentionally. On the other hand, understanding the laws that govern international student enrollment is critical to managing internal policy. Whether it’s international or domestic, often our own policies can be a source of great frustration. Details are important. While this is true in much that we do professionally, I point this lesson out because of the many differences in international recruitment relative to what admissions offices deal with regularly. It’s easy to take what we deal with every day for granted. Whether it’s the language barriers or time zones (and not just 2 hours difference), it’s very important to plan and coordinate communication often with prospective students, agents, agencies, or partner institutions. It’s not as easy as just picking up the phone at 2:00 in the afternoon. Also, I had to remind myself that most of these students don’t have a college counseling office in their high school. Nothing should be taken for granted and be very careful assuming anything. Find professional allies. I learned much through the experience, but it’s safe to say that I received two different answers from colleagues to questions on a regular basis and therefore it’s not always easy to know the correct or best path to follow. As a result, it’s important to have some professional allies outside your institution that you can call and seek advice. Higher education is typically a very collegial professional environment and international recruitment is a great example of this. Keep in mind, however, that often there can be multiple answers and the options aren’t always black and white. Again, professional allies are quite beneficial even in domestic recruiting whether it be listserves or your personal mentor. It takes a village. Most institutions have processes for domestic student enrollment that are well understood and have built-in on-campus collaboration. For example, new student course registration, orientation, move-in processes, and simple paperwork are just a few. It’s not necessarily easy to just infuse your international students into these processes without some level of modification. Moreover, consider if you have 6 or 60 international students! Even with just 6 international students, many offices must be collaborating in order to make the transitional experience efficient and effective. It’s still who you know! In my opinion, effective international recruitment still requires a key relationship to set anything in motion. Without that relationship, the world just seems too big. However, the right relationship can turn into a very promising partnership. The experience is very rewarding. I’m grateful for the experience I had this summer and look forward to an opportunity to strengthen our relationship with some Chinese partners while also looking to expand our international footprint. Doane College welcomed six students from China this fall resulting from a new partnership. I anticipate that our international recruitment plan at Doane College will evolve significantly over the next 12-18 months. I look forward to this challenge and opportunity to learn, not only from our new partners but possibly from some of you out in the higher education world who have already parted the waters of the international recruitment sea. 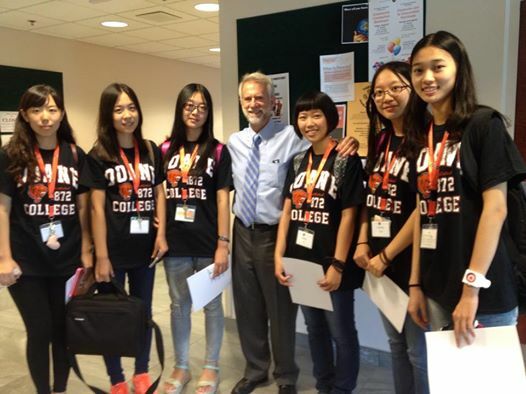 Dr. Jacque Carter, Doane College President, with 6 international students from China. → All you have to do is get them here! It takes the whole village to raise the kid! The kid is growing everyday and eventually will be a strong man with the love, effects and patience inputed.